For other uses, see Being (disambiguation). In philosophy, being means the existence of a thing. Anything that exists has being. Ontology is the branch of philosophy that studies being. Being is a concept encompassing objective and subjective features of reality and existence. Anything that partakes in being is also called a "being", though often this usage is limited to entities that have subjectivity (as in the expression "human being"). The notion of "being" has, inevitably, been elusive and controversial in the history of philosophy, beginning in Western philosophy with attempts among the pre-Socratics to deploy it intelligibly. The first effort to recognize and define the concept came from Parmenides, who famously said of it that "what is-is". Common words such as "is", "are", and "am" refer directly or indirectly to being. As an example of efforts in recent times, Martin Heidegger (who himself drew on ancient Greek sources) adopted after German terms like Dasein to articulate the topic. Several modern approaches build on such continental European exemplars as Heidegger, and apply metaphysical results to the understanding of human psychology and the human condition generally (notably in the Existentialist tradition). By contrast, in mainstream Analytical philosophy the topic is more confined to abstract investigation, in the work of such influential theorists as W. V. O. Quine, to name one of many. One of the most fundamental questions that has been contemplated in various cultures and traditions (e.g., Native American) and continues to exercise philosophers is articulated thusly by William James: "How comes the world to be here at all instead of the nonentity which might be imagined in its place? ... from nothing to being there is no logical bridge." The deficit of such a bridge was first encountered in history by the Pre-Socratic philosophers during the process of evolving a classification of all beings (noun). Aristotle, who wrote after the Pre-Socratics, applies the term category (perhaps not originally) to ten highest-level classes. They comprise one category of substance (ousiae) existing independently (man, tree) and nine categories of accidents, which can only exist in something else (time, place). In Aristotle, substances are to be clarified by stating their definition: a note expressing a larger class (the genus) followed by further notes expressing specific differences (differentiae) within the class. The substance so defined was a species. For example, the species, man, may be defined as an animal (genus) that is rational (difference). As the difference is potential within the genus; that is, an animal may or may not be rational, the difference is not identical to, and may be distinct from, the genus. Applied to being, the system fails to arrive at a definition for the simple reason that no difference can be found. The species, the genus, and the difference are all equally being: a being is a being that is being. The genus cannot be nothing because nothing is not a class of everything. The trivial solution that being is being added to nothing is only a tautology: being is being. There is no simpler intermediary between being and non-being that explains and classifies being. The Being according to Parmenides is like the mass of a sphere. Pre-Socratic reaction to this deficit was varied. As substance theorists they accepted a priori the hypothesis that appearances are deceiving, that reality is to be reached through reasoning. Parmenides reasoned that if everything is identical to being and being is a category of the same thing then there can be neither differences between things nor any change. To be different, or to change, would amount to becoming or being non-being; that is, not existing. Therefore, being is a homogeneous and non-differentiated sphere and the appearance of beings is illusory. Heraclitus, on the other hand, foreshadowed modern thought by denying existence. Reality does not exist, it flows, and beings are an illusion upon the flow. and reiterates in no uncertain terms: "Nothing, then, which is not a species of a genus will have an essence – only species will have it ....". Being, however, for Aristotle, is not a genus. One might expect a solution to follow from such certain language but none does. Instead Aristotle launches into a rephrasing of the problem, the Theory of Act and Potency. In the definition of man as a two-legged animal Aristotle presumes that "two-legged" and "animal" are parts of other beings, but as far as man is concerned, are only potentially man. At the point where they are united into a single being, man, the being, becomes actual, or real. Unity is the basis of actuality: "... 'being' is being combined and one, and 'not being' is being not combined but more than one." Actuality has taken the place of existence, but Aristotle is no longer seeking to know what the actual is; he accepts it without question as something generated from the potential. He has found a "half-being" or a "pre-being", the potency, which is fully being as part of some other substance. Substances, in Aristotle, unite what they actually are now with everything they might become. Some of Thomas Aquinas' propositions were reputedly condemned by Étienne Tempier, the local Bishop of Paris (not the Papal Magisterium itself) in 1270 and 1277, but his dedication to the use of philosophy to elucidate theology was so thorough that he was proclaimed a Doctor of the Church in 1568. Those who adopt it are called Thomists. The nature of "being" has also been debated and explored in Islamic philosophy, notably by Ibn Sina (Avicenna), Suhrawardi, and Mulla Sadra. A modern linguistic approach which notices that Persian language has exceptionally developed two kinds of "is"es, i.e. ast ("is", as a copula) and hast (as an existential "is") examines the linguistic properties of the two lexemes in the first place, then evaluates how the statements made by other languages with regard to being can stand the test of Persian frame of reference. In this modern linguistic approach, it is noticed that the original language of the source, e.g. Greek (like German or French or English), has only one word for two concepts, ast and hast, or, like Arabic, has no word at all for either word. It therefore exploits the Persian hast (existential is) versus ast (predicative is or copula) to address both Western and Islamic ontological arguments on being and existence. This linguistic method shows the scope of confusion created by languages which cannot differentiate between existential be and copula. It manifests, for instance, that the main theme of Heidegger's Being and Time is astī (is-ness) rather than hastī (existence). When, in the beginning of his book, Heidegger claims that people always talk about existence in their everyday language, without knowing what it means, the example he resorts to is: "the sky is blue" which in Persian can be ONLY translated with the use of the copula ast, and says nothing about being or existence. In the same manner, the linguistic method addresses the ontological works written in Arabic. Since Arabic, like Latin in Europe, had become the official language of philosophical and scientific works in the so-called Islamic World, the early Persian or Arab philosophers had difficulty discussing being or existence, since the Arabic language, like other Semitic languages, had no verb for either predicative "be" (copula) or existential "be". So if you try to translate the aforementioned Heidegger's example into Arabic it appears as السماء زرقاء (viz. "The Sky-- blue") with no linking "is" to be a sign of existential statement. To overcome the problem, when translating the ancient Greek philosophy, certain words were coined like ایس aysa (from Arabic لیس laysa 'not') for 'is'. Eventually the Arabic verb وجد wajada (to find) prevailed, since it was thought that whatever is existent, is to be "found" in the world. Hence existence or Being was called وجود wujud (Cf. Swedish finns [found]> there exist; also the Medieval Latin coinage of exsistere 'standing out (there in the world)' > appear> exist). Now, with regard to the fact that Persian, as the mother tongue of both Avicenna and Sadrā, was in conflict with either Greek or Arabic in this regard, these philosophers should have been warned implicitly by their mother tongue not to confuse two kinds of linguistic beings (viz. copula vs. existential). In fact when analyzed thoroughly, copula, or Persian ast ('is') indicates an ever-moving chain of relations with no fixed entity to hold onto (every entity, say A, will be dissolved into "A is B" and so on, as soon as one tries to define it). Therefore, the whole reality or what we see as existence ("found" in our world) resembles an ever-changing world of astī (is-ness) flowing in time and space. On the other hand, while Persian ast can be considered as the 3rd person singular of the verb 'to be', there is no verb but an arbitrary one supporting hast ('is' as an existential be= exists) has neither future nor past tense and nor a negative form of its own: hast is just a single untouchable lexeme. It needs no other linguistic element to be complete (Hast. is a complete sentence meaning "s/he it exists"). In fact, any manipulation of the arbitrary verb, e.g. its conjugation, turns hast back into a copula. Eventually from such linguistic analyses, it appears that while astī (is-ness) would resemble the world of Heraclitus, hastī (existence) would rather approaches a metaphysical concept resembling the Parmenidas's interpretation of existence. In this regard, Avicenna, who was a firm follower of Aristotle, could not accept either Heraclitian is-ness (where only constant was change), nor Parmenidean monist immoveable existence (the hastī itself being constant). To solve the contradiction, it so appeared to Philosophers of Islamic world that Aristotle considered the core of existence (i.e. its substance/essence) as a fixed constant, while its facade (accident) was prone to change. To translate such a philosophical image into Persian it is like having hastī (existence) as a unique constant core covered by astī (is-ness) as a cloud of ever-changing relationships. It is clear that the Persian language, deconstructs such a composite as a sheer mirage, since it is not clear how to link the interior core (existence) with the exterior shell (is-ness). Furthermore, hast cannot be linked to anything but itself (as it is self-referent). The argument has a theological echos as well: assuming that God is the Existence, beyond time and space, a question is raised by philosophers of the Islamic world as how he, as a transcendental existence, may ever create or contact a world of is-ness in space-time. However, Avicenna who was more philosopher than theologian, followed the same line of argumentation as that of his ancient master, Aristotle, and tried to reconcile between ast and hast, by considering the latter as higher order of existence than the former. It is like a hierarchical order of existence. It was a philosophical Tower of Babel that the restriction of his own mother tongue (Persian) would not allow to be built, but he could maneuver in Arabic by giving the two concepts the same name wujud, although with different attributes. So, implicitly, astī (is-ness) appears as ممکن الوجود "momken-al-wujud" (contingent being), and hastī (existence) as واجب الوجود "wājeb-al-wujud" (necessary being). On the other hand, centuries later, Sadrā, chose a more radical route, by inclining towards the reality of astī (is-ness), as the true mode of existence, and tried to get rid of the concept of hastī (existence as fixed or immovable). Thus, in his philosophy, the universal movement penetrates deep into the Aristotelian substance/essence, in unison with changing accident. He called this deep existential change حرکت جوهری harekat-e jowhari (Substantial Movement). In such a changing existence, the whole world has to go through instantaneous annihilation and recreation incessantly, while as Avicenna had predicted in his remarks on Nature, such a universal change or substantial movement would eventually entail the shortening and lengthening of time as well which has never been observed. This logical objection, which was made on Aristotle's argumentation, could not be answered in the ancient times or medieval age, but now it does not sound contradictory to the real nature of Time (as addressed in relativity theory), so by a reverse argument, a philosopher may indeed deduce that everything is changing (moving) even in the deepest core of Being. Although innovated in the late medieval period, Thomism was dogmatized in the Renaissance. From roughly 1277 to 1567, it dominated the philosophic landscape. The rationalist philosophers, however, with a new emphasis on Reason as a tool of the intellect, brought the classical and medieval traditions under new scrutiny, exercising a new concept of doubt, with varying outcomes. Foremost among the new doubters were the empiricists, the advocates of scientific method, with its emphasis on experimentation and reliance on evidence gathered from sensory experience. In parallel with the revolutions against rising political absolutism based on established religion and the replacement of faith by reasonable faith, new systems of metaphysics were promulgated in the lecture halls by charismatic professors, such as Immanuel Kant and Hegel. The late 19th and 20th centuries featured an emotional return to the concept of existence under the name of existentialism. 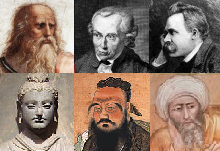 These philosophers were concerned mainly with ethics and religion. The metaphysical side became the domain of the phenomenalists. In parallel with these philosophies Thomism continued under the protection of the Catholic Church; in particular, the Jesuit order. Rationalism and empiricism have had many definitions, most concerned with specific schools of philosophy or groups of philosophers in particular countries, such as Germany. In general rationalism is the predominant school of thought in the multi-national, cross-cultural Age of reason, which began in the century straddling 1600 as a conventional date, empiricism is the reliance on sensory data gathered in experimentation by scientists of any country, who, in the Age of Reason were rationalists. An early professed empiricist, Thomas Hobbes, known as an eccentric denizen of the court of Charles II of England (an "old bear"), published in 1651 Leviathan, a political treatise written during the English civil war, containing an early manifesto in English of rationalism. "Yet they will have us beleeve, that by the Almighty power of God, one body may be at one and the same time in many places [the problem of the universals]; and many bodies at one and the same time in one place [the whole and the parts]; ... And these are but a small part of the Incongruencies they are forced to, from their disputing philosophically, instead of admiring, and adoring of the Divine and Incomprehensible Nature ...."
The real distinction between essence and existence, and that between form and matter, which served for so long as the basis of metaphysics, Hobbes identifies as "the Error of Separated Essences." The words "Is, or Bee, or Are, and the like" add no meaning to an argument nor do derived words such as "Entity, Essence, Essentially, Essentiality", which "are the names of nothing" but are mere "Signes" connecting "one name or attribute to another: as when we say, "a man is a living body", we mean not that the man is one thing, the living body another, and the is, or being a third: but that the man, and the living body, is the same thing; ..." Metaphysiques, Hobbes says, is "far from the possibility of being understood" and is "repugnant to natural reason." Fromm, To Have or to Be? ^ a b Heidegger, the day Sein und Zeit, p. 27: "this entity which each of us is himself ... we shall denote by the term 'Dasein'." ^ James, William (1916). Some problems of philosophy: a beginning of an introduction to philosophy. New York: Longmans, Green and Co. pp. 38, 40. ^ Aristotle. "Book VII Section 1 (paragraph 1028b)". Metaphysics. ^ Metaphysics Chapter VII, Section 4 (paragraph 1030a). ^ Metaphysics, Book IX, Chapter 10 (paragraph 1051b). ^ Wallace, William A. “Thomism and Its Opponents.” Dictionary of the Middle Ages. Ed. Joseph R. Strayer. Vol. 12. New York: Scribner, 1982. 38–45. Print. ^ Wippel, John F. (2000). The metaphysical thought of Thomas Aquinas: from finite being to uncreated being. Monographs of the Society for Mediaeval and Renaissance Philosophy, No. 1. The Catholic University of America Press. p. 75. ^ "SUMMA THEOLOGIAE: The names of God (Prima Pars, Q. 13)". www.newadvent.org. Retrieved 15 March 2018. ^ "Iranian Personalities: Sadr Al-Din Mohammad Shirazi". www.iranchamber.com. Retrieved 15 March 2018. ^ "age of reason". dictionary.com. Retrieved 8 January 2009. ^ "empiricism". dictionary.com. Archived from the original on 25 January 2009. Retrieved 9 January 2009. ^ Hobbes 1651, p. 501. ^ Hobbes 1651, p. 500. ^ Hobbes 1651, pp. 498–499. ^ Hobbes 1651, pp. 496–497. ^ Hobbes 1651, p. 497. ^ Fritzman, J. M. (12 October 2011). "Review of Kant, Kantianism, and Idealism: The Origins of Continental Philosophy". ISSN 1538-1617. ^ "Analytic philosophy". Encyclopedia Britannica. Retrieved 6 October 2018. Gilson, Étienne (1952). Being and Some Philosophers (2nd corrected and enlarged ed.). Toronto: Pontifical Institute of Mediaeval Studies (PIMS). Hobbes, Thomas (1904) . Waller, Alfred Rayney (ed.). Leviathan: or, The matter, forme & power of a commonwealth, ecclesiasticall and civill. Cambridge: University Press. Look up being in Wiktionary, the free dictionary. Corazzon, Raul (2010). "Theory and History of Ontology from a Philosophical Perspective". www.ontology.co. Retrieved 9 October 2010.